As experienced meditators will tell you, the skill of meditation is not something easily accomplished by reading a book. Meditation is simple but subtle, and asks us to patiently re-train our bodies and minds in peace and simplicity so that we can experience the benefits of greater relaxation, lower stress, increased clarity and general well-being. This course will introduce you step by step to the practice of mindfulness. You will learn fundamental meditation techniques including the body scan, mindfulness of breathing, walking meditation and more. Each weekly meeting includes guided meditation, talks, and discussion. The class format is set up to provide opportunity for personal guidance from a qualified teacher as well as for sharing experiences with others in the class. Seating options include chairs or meditation cushions. For those relatively new to meditation, this is the place to start. We offer ‘A Day of Guided Mindfulness Meditation’ for those who take this course because research has shown that people experience greater success in meditation when they integrate the learning from the weekly course with a day of guided practice. You can register for the day-long program separately at any time. But we give a special discount if you sign up for the retreat at the same time as you register for the 8-week course. Early bird discount of $25 when registered by April 5 for the Spring session, or by July 1 for the Summer session. 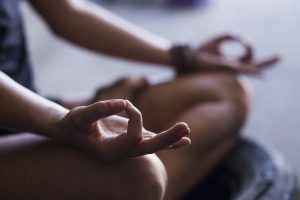 This special early registration discount option includes the 8-week course and ‘A Day of Guided Mindfulness Meditation’ on Saturday June 1 for the Spring session only. This option is only available when signing up for the 8-week course. Click here to read about the retreat.